Court reporting is at the CORE of what we do. Our reliable and certified court reporters are experts in all types of litigation such as corporate litigation, personal injury, patent suits, arbitrations, meetings, and hearings. We combine national best practices and technologies with local management of transcript production to provide the highest quality of court reporting throughout the state of Michigan and Nationwide. Whether its binders, boxes, folders or electronic documents, we have the team to complete the job. From scanning, printing, binding, Bates stamping, creating digital files and more. We offer black and white, and color services as well as pickup and delivery services. Let our team help simplify the process with our top-notch reproduction services. Bring life to your exhibits. Let us enhance your trial with high-impact visuals. Call out important evidence, highlight a page in a transcript or bring clarity to medical testimony. Complimentary pick-up and delivery, and never any rush fees. Need help with your trial presentations? From TrialDirector to PowerPoint and everything in between, CORE Litigation can help you create dynamic, professional presentations quickly with no hassle! When reading a transcript, do you wish you could hear their tone of voice, see their body language, or how long they pause before answering? Well, video displays those important non-verbal components of the deponent. With over 28 years of experience with video depositions and state of the art equipment, you can be assured that our CORE technicians will deliver the highest quality legal video, leveraging the full impact of testimony. You can trust the CORE team. Did you know that when people read and listen, they are more likely to comprehend and retain the information? That’s why Video Syncing for your next trial is so important. Get a single screen for displaying both transcript and video. CORE loads the text of the completed transcript into the video system, then matches blocks of the transcript to the related sections of the video. As the video plays, the transcript text scrolls on screen with the speaker. When complete, the transcript can be used as a guide to finding any part of the recorded testimony. Create “snippets” or search efficiently for presentations and additional research. Have parts of a video deposition you need taken out? Want to use sections of a video for opening and closing arguments? Our trained technicians can edit your videos in a multitude of ways to meet your needs. With our editing services, we can cut out those sections of video testimony ahead of time for a smooth playback without all the long silent periods. We can shorten surveillance footage so the jury sees the important things without having to watch long periods of inactivity. We also do lectures, seminars, and meetings. We can work with you to create a product that fits your need. Precision video playbacks are a standard for our Legal Video Specialists. High-lumen projectors, large screens, and quality speakers enable the jury to see and hear video depositions. Be assured that only approved testimony is played before the jury. We offer a vast array of equipment for rent. Whether you need a projector, screen, document camera or something else, we have it. Our trained technicians can set up the equipment on location for you or meet with you and show you how to do it yourself. When you’re done, just give us a call and we’ll pick up the equipment. Need a place to conduct your deposition? We offer advanced facilities equipped with technology, security, and support services. Our attractive, comfortable, state-of-the-art deposition suites are completely complementary and staffed to support your needs. CORE facilities incorporate advanced technology and tools such as videography, real-time data feeds, transcript synchronization, wireless internet, video and transcript streaming plus the ability to connect live to other CORE facilities or affiliate sites. An on-site CORE Ambassador and/or technician will assist with set-up, administrative, and food and beverage services, making sure you have everything you need in our private, comfortable conference room. HIPAA & PII standards ensure that your confidential personal and medical documents are secure during the deposition and through the production and distribution process. Videoconferencing is a valuable and cost-saving tool when it is not possible or efficient to have everyone in one room. Our facilities have comfortable videoconference rooms with broadcast-quality video cameras and transmission to remote sites with clear and precise streaming. Rooms also include high definition video screens, as well as high-quality phone systems. You may connect as many remote locations as needed, and even record the conference for later use. Take advantage of our CORE connections. 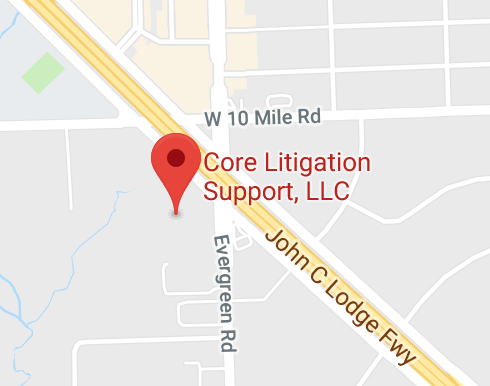 Not only do we serve Detroit and the entire state of Michigan, but we also we have relationships with litigation support firms all over North America. We can help you find and retain the highest-quality court reporters, videographers, and visual enlargement services you need nationwide. You can expect dependable performance from CORE, anywhere and anytime. Our high definition video will make sure no detail is missed. Whether it’s at home, a facility, or somewhere else, we travel to you. We work with you to make a detailed plan of all the activities that need to be filmed, and then work with you through the editing process to ensure you get the final product you want. Don’t chance quality for convenience. Our techs have the knowledge and understanding to capture exactly what you need. Whether it’s an area location, damage to a vehicle, injuries a client sustained, or something else.